Sam and Geoff talk Roku 3, Internet Sales Tax, the Retron5 and Sons of Anarchy and much more, along with The Weekly Whatchas. The music in the audio program is “American Trash” by Innerpartysystem. The full song will play after the show on the podcast. They have given us permission in the past and I’m sure they would do so again if they hadn’t called it quits in 2011. If you are an old school gamer and love your cartridges, this may just be your thing. 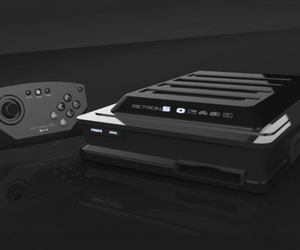 The Retron 5 by Hyperkin will play just about any cartridge-based game and upscale them to 720p through HDMI. The unit is compatible with NES, SNES, Famicom, Super Famicom, Game Boy Advance, Game Boy Color, Game Boy, as well as Mega Drive and Genesis titles. Add to this it’s ability to save anywhere with a variety of options, and you’ve got yourself a winner. The expected retail price will be under $100. It may end up only being a penny shy of that, but I guess you have to take what you can get! I suppose it couldn’t last forever! I am a big fan of shopping online. One of the greatest benefits to my Amazon Prime membership is that I could get things shipped to me for free of shipping fees or sales tax, but not for much longer! There are a couple of more hurdles for this bill to hop, but with how it has been packaged and the margin that it won in the Senate, this will soon be a reality. With Xbox ‘Durango’ Requiring Full Game Installs, Is Microsoft Locking Out Used Game Sales? Earlier this week, fresh screenshots of the Durango XDK (the developer kit) leaked, and pointed to the next-generation Xbox console requiring all games to be installed to the hard drive. According to the alleged documents, retail game discs will be installed to the console’s hard drive and users can begin playing the game during installation. However, once the game is fully installed the game disc is no longer necessary, and playing from the optical drive will actually be prevented. While these things aren’t proof positive, it seems to be leaning in that direction. The end of the article points out something that we have discussed on the show: Many popular games have used purchasers buy the pass that allows multi-player. They could do a similar thing to unlock the disc. That is, unless MS decides to lock discs to a single console or gamertag.